Why Should You Choose Mutual Funds Over Fixed Deposits? 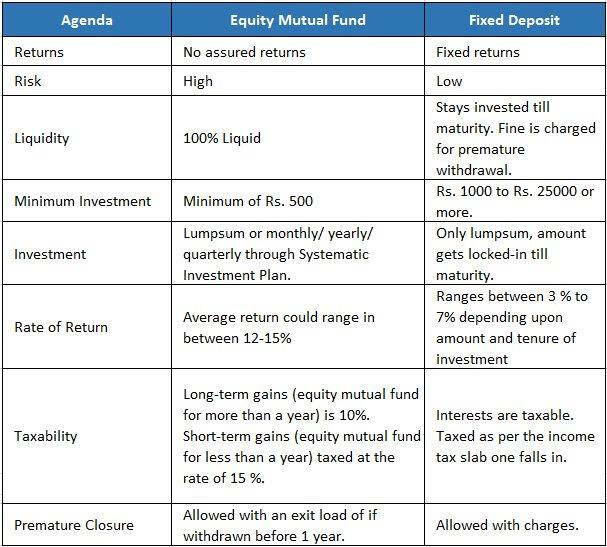 Read this blog to get a detailed comparison between mutual funds and fixed deposits along with the various pros and cons of the two investment options. So you are planning to make an investment but you are still confused between a Fixed Deposit and a Mutual Fund? You strongly believe in the traditional practice of investing in fixed deposits but you are afraid that it doesn't pay you good enough to fulfil your set of goals. On the other hand, you wish to go ahead and invest in mutual funds but are worried about the risks. This happens with most of the people in India. They have a strong faith in the fixed deposits, as it has been a tool that offers returns at low risks and fixed interest rate. But seeing the kind of growth mutual fund investment is offering, people have started to invest in them. Though there may be risks due to their direct association with the markets, the investment made is monitored and regulated by an expert fund manager who makes every effort to safeguard your money. Further, mutual funds are the best liquid funds where you can withdraw your money at any time you wish to, whereas fixed deposits hold your money until it gets matured. Being a new and conservative investor, if you don’t want to start with equity mutual funds directly, you can consider debt mutual funds which offer better returns than fixed deposits. However, if you are someone who can stomach moderate to high risk, then it’s time you must try experiencing the kind of benefits equity mutual funds offer. 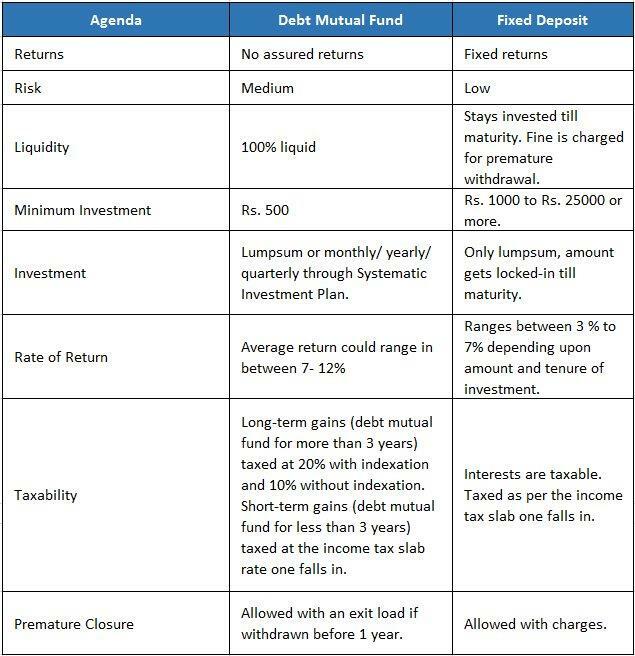 To understand as to what could be the pros and cons of investing in mutual funds over fixed deposits, we need to see a detailed comparison of both the investment options. Debt funds are good for making a low-risk investment where your investment is well protected but doesn’t give exceptional returns. If you want that your invested money should be protected while you can still get higher returns than fixed deposits, then debt mutual fund is the most recommended investment plan for you. Equity funds usually extend high returns but are considered to be risky. Hence, it is recommended to invest in mutual funds if you are comfortable with taking risks for higher returns. Mutual funds deliver better and higher returns than traditional investment options including RDs and FDs. Though there are certain risks, mutual fund investments are managed by experts known as fund managers who take the responsibility of protecting the health of an investment. They keep track of every investment of the investors and make sure that their expected goals are achieved. Such specialized supervision and management are not available with any of the traditional investment plans. So, a mutual fund comes out to be the best investment practice and you can go ahead with it without any hassle. To seek guidance on the same, connect with us at MySIPonline. We will be happy to serve you with all our might. Are Balanced Funds Better Than Balanced Advantage Funds?